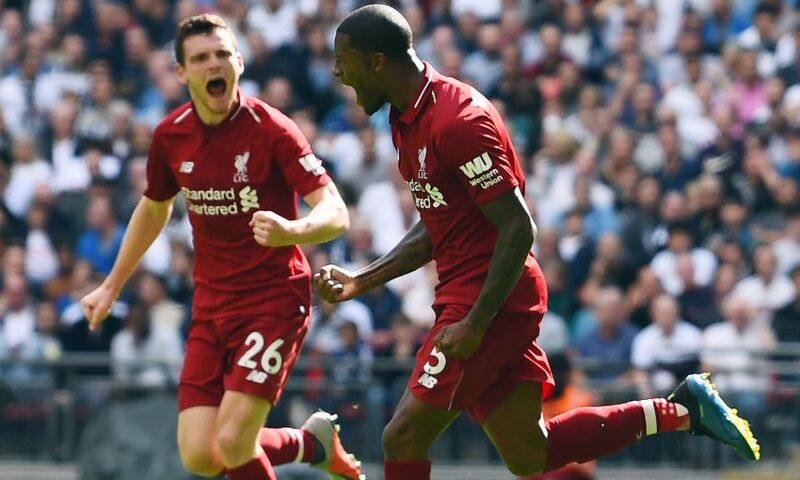 Liverpool produced a superb away performance to seal a 2-1 win over Tottenham Hotspur at Wembley on Saturday. Georginio Wijnaldum and Roberto Firmino were on the mark as the Reds made it five straight wins in the Premier League. A fifth straight win extended the Reds' best start to a season since 1990 as they continue to set the pace in the Premier League. This triumph will serve to fuel the belief that they can stay there. The progress Klopp masterminded last term – coupled with this summer's show of ambition in the transfer market – had pointed to Liverpool being genuine title contenders this time around. Now they have proved it. Bold words have been backed up with actions. This was a statement win - Liverpool's first away to one of their top-six rivals since they collected maximum points at Stamford Bridge two years ago. Their biggest test of the campaign to date was passed with flying colours. It was the perfect way to kick off a potentially season-defining three weeks as they compete on three fronts. Last October the away end at Wembley was virtually empty when Liverpool were finally put out of their misery. Their frailties had been brutally exposed. This time around a jubilant travelling Kop provided the soundtrack for the celebrations as 'Allez, Allez, Allez' echoed around the national stadium. Make no mistake, the scoreline massively flattered Spurs, who were comprehensively outworked and outclassed. Liverpool dominated from start to finish and only some slack finishing and dodgy decision making in the final third saved Mauricio Pochettino's side from a proper hammering. Spurs have finished above Liverpool in eight of the last nine seasons but it's hard to see that happening again this term. Get ready. It looks as though, this time, the Reds really are coming up the hill. It was not that Liverpool played irresistibly well. This was not a performance to drive the imagination or a whirl of red pain for Tottenham. Instead this felt like something better. Liverpool were solid in every position, their combinations well-grooved, every starting player blessed with the same intelligence, the same speed and spiky aggression. There was some fine movement at times from Sadio Mané and Roberto Firmino, who still seems to be under the impression he has only borrowed the centre-forward position and needs to absolutely thrash it into the ground every second he is there before someone asks for it back. Nobody tell him just yet. James Milner made more tackles than anyone else and prowled the midfield with a snarl, snapping after the ball like a pair of ragged claws across the turf. Virgil van Dijk did not seem to do very much, but still gave the impression of being the game’s designated grown-up. But this was, above all, an expression of the collective, the shared will of those red shirts. It was these qualities rather than any outstanding individual show that drove Liverpool to a win that made it five in a row at the start of the season for the first time since 1990. Only one of those victories has been comfortable. Three have been away from home. Six different players have scored. Nobody out there is going to match Manchester City for football of the imagination or attacking resources, for the ability to take the game away from their opponents. But this team has something else in Jürgen Klopp’s third full season. Liverpool are ticking. Liverpool have not looked this good for quite some time. And today’s 2-1 victory over Tottenham - a scoreline that flattered Spurs - is further proof of that. Before the match, many were expecting this to be a test. A big one at that. Spurs, despite losing to Watford two weeks ago, had swept Manchester United aside at Old Trafford. Any team who can do that would be hard to beat. But, from the off, Liverpool were in control. Roberto Firmino was robbed of an early goal courtesy of the offside flag. Mohamed Salah and Sadio Mane, ever the threat, looked in the mood. The Reds’ rip-roaring attack was too much for Tottenham. But this has been years in the making. Liverpool are now finally beginning to resemble an end product. When Klopp took the reins three years ago, this was what the Reds hierarchy had in mind. Liverpool are a terrible team to chase the game against because they are so good on the break, and Spurs had to be immaculate after going behind. But Mane could get in behind Trippier so easily every time he attacked and it was no real surprise when Liverpool had their second. From there, Liverpool looked like scoring every time they broke and on another day they would have scored four or five.